Huntingdon Valley, PA home owner commissions Bucks County rug store Brandon Oriental Rugs to straighten and shorten her used rug so it can be used in her new home. Bucks County rug store Brandon Oriental Rugs does rug repair, rug restoration and rug alteration. The image above shows a twenty foot crooked runner purchased elsewhere for a prior home by our Huntingdon Valley, PA customer. 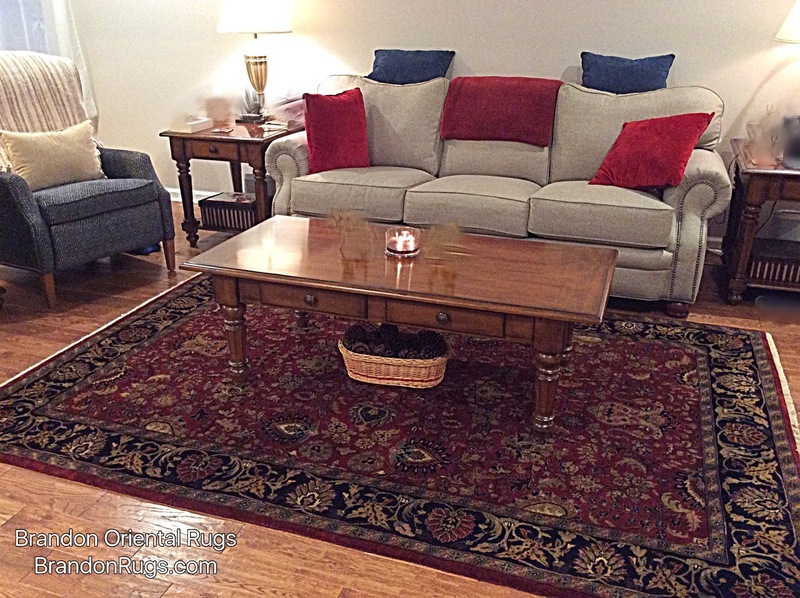 The next image shows the same rug altered to fit the customer's new home. It has been shortened to sixteen feet, and straightened. Can you see where the work was performed? The final image (below; from the back of the rug) shows the line where the the good sections of rug were joined for the desired result. Can you tell where the work was performed? For quality repairs (and proper cleaning of your delicate antique rugs, handmade oriental rugs, and better quality wool area rugs -- e.g. those made by Karastan) please CALL Brandon to discuss needs and recommendations for your specific rug(s). Brandon Oriental Rugs also performs rug appraisals to provide documentation of value required for rugs valued over $10,000, or to provide proof of value for resale or in settlement of claims of loss. Refinished hardwood floors, new window-treatments, and new living room sofas led owners of this Doylestown, PA home to Brandon Oriental Rugs to select a fine quality hand-made oriental rug to place in their comfortable "new" living room. With pets and lotsa traffic in this heavily used room of their home, they chose this finely detailed 10x14 hand-knotted rug made in India. Crafted with hand-spun wool and vegetal dyes in deep, traditional colors, it brings focus and intimacy to the main seating group. 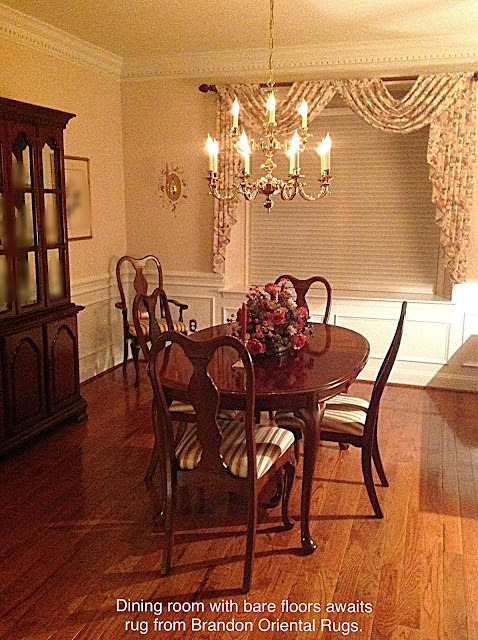 Fine quality reproduction hand-knotted Tabriz design rugs (selected from Bucks County, PA rug store Brandon Oriental Rugs by a Doylestown interior designer for her clients) were the perfect complements for the entry hall and dining room of this elegantly furnished Basking Ridge, NJ home. There is no disputing [good] taste. Quality always gives evidence of itself, and endures. Brandon Oriental Rugs -- 9x12 hand-knotted oriental rug made in India (Turkish Oushak design) has a big supporting role in a newly furnished living room in a newly renovated new home (for the homeowners) in Doylestown. 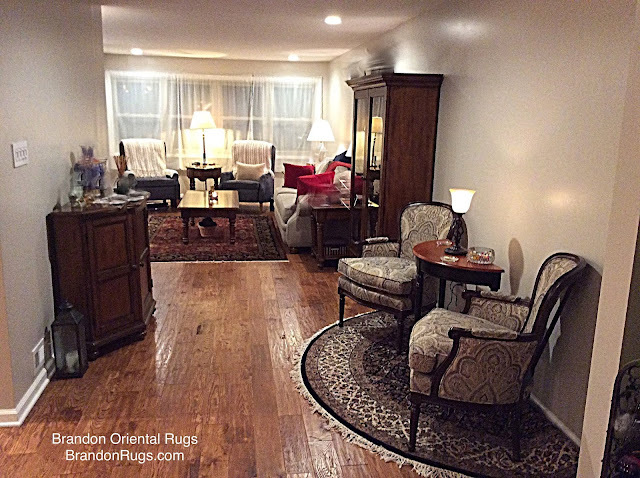 At Brandon Oriental Rugs (the rug specialty store in Bucks County, PA) we specialize in REAL handmade oriental rugs, and services tailored to homeowners and their designers who are seeking the best of what is available in fine quality rugs at the best possible prices. "I am tired of that common look." "Those rugs that look like someone spilled a can of paint on them do NOT interest me." "I don't want a rug that looks like it came from Renovation Hardware or Pier One Imports or Ollie's or Home Depot, or anywhere else offering a programmed look." "I don't want a rug that looks like everything else you see on the first three pages of every internet rug site." "If it is something that looks like I could buy it out of a catalog, I'll pass." "I've spent a lot of time and money creating a unique interior design statement and environment in my home. I do NOT want a rug that looks like everyone else can have it, or anything that is being promoted to everyone else as "fashionable" and "trendy". "If it has an SKU associated with it, don't even mention it to me. I'm one-of-a-kind; I only buy one-of-a-kind." You want to put something outstanding on the floors of your home; not something commonplace. You've been looking at the challenge for a long time, but are not sure about the next step. Crowds can be found everywhere, including fashion for your home. Unfortunately an attitude of "one size/one style fits all" has overtaken the marketplace. "NEW" products all seem alike. This is evident too with handmade oriental rug production. Traditionally distinctive, high quality hand-knotted rugs are being tossed aside for product resembling wall-to-wall carpet. Rug after rug is imbued with unimaginative monotony, and mass-market commonality. "Looks" that seemed unique, edgy and interesting yesterday, last year (or five years ago) are oppressively commonplace now. With so much looking all the same, rug-lovers, rug-collectors, rug-aficionados are again feeling the urge to find unique alternatives to what everybody has. As a specialty rug store in business over twenty-five years, Brandon Oriental Rugs - BrandonRugs.com - has witnessed all of the trends and style shifts for more than a quarter century. Through every "seismic shift in fashion", the prevailing trend in floor coverings has continued to be an embrace of traditional quality found in handmade rugs crafted in original styles with traditional colors, materials and techniques. "There's nothing like the REAL thing." The image below is a screen-cap of a "Call to Action" page to promote web-sales via the "STORE" associated with the HOUZZ.com home furnishing/ home decor portal. HOUZZ was originally established as an open-invitation site to design professionals and design-related retailers (in interior design, home furnishings, architecture, and landscaping) to showcase their design ideas, projects, and achievements on behalf of clients. The projects thus showcased became the source of aspirational "ideabooks" and resource information for all with accounts on the portal. HOUZZ.com has since morphed into an e-commerce site. This transformation minimized the initial accent to users for finding local talent and resources in order to achieve design goals -- apparently in a reorientation to promote world-wide-web "take your chances" marketing by pay-to-play businesses. This has predictably resulted in shifting the admirable initial focus of the site from novelty, creativity, uniqueness and quality to a common "get what you pay for", "race-to-the-basement pricing", "lowest price", SEO-motivated opportunism. Browsers of the site can still get introduced to great ideas, but will have to filter-out a lot of up-front promotional gimmickry to truly delve into them. All of that said (as a preamble): There is a BIG problem with the advertisement above -- apart from the worn-out "75% OFF" lure (see: http://bit.ly/2yiSdUf and http://bit.ly/2y8dTSb ). Even if it has become standard in our culture to make BIG things out of small things, it is incorrect to suggest that a 7'x9' rug is "OVERSIZE". In fact, 6'x9' is the smallest of what is considered STANDARD ROOM-SIZE" in the trade. Here is a list of real handmade area-rug "standard" sizes (in feet): 2x3, 3x5, 4x6, 5x7, 6x9, 8x10, 9x12, 10x14, 12x15, 12x18. These are "nominal" standards. Variation of several inches from these standards is not uncommon because of the need to maintain symmetry in border design as a rug is completed. So called "Persian rug sizes" differ somewhat because in Iran (and sometimes by choice in other rug making countries) the metric standard is used. Since accurate description of items for sale is a key tenet in promoting e-commerce activity, misleading descriptions (intentional or otherwise) invite scrutiny. Consumers of information (and products described by that information) should wonder why a prominent social media site chose to call something "oversize" that is merely average in size (a 7'x9' area rug) . "THE MEANING OF COMMUNICATION IS THE RESPONSE THAT YOU GET." Consumers have become desensitized to superlatives, and disregard or discount much labelling. Calling the smallest size "LARGE" is part of the conditioning that ultimately keeps expectations small. Sadly, the fruits of such programming are that BIG dreams eventually won't amount to much. Perhaps we are seeing such results already in ways we are only beginning to fathom. "The Meaning of Communication Is the Response You Get": Propaganda and resulting Mass-Hypnosis by Power-Players Are Reshaping Conventional Understanding about Word Meaning which Facilitates Exploitation of Consumer Needs and Desires." 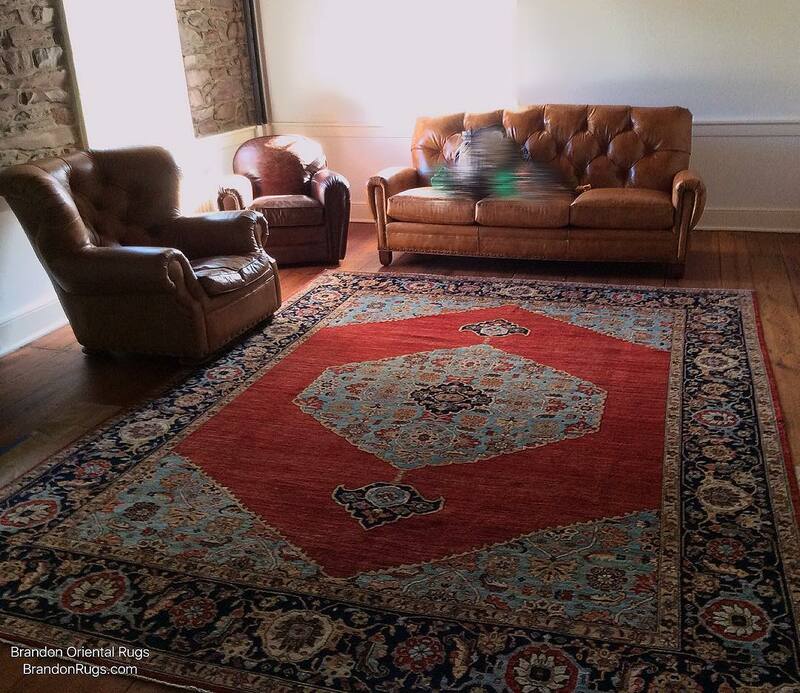 Brandon Oriental Rugs -- This room, beautifully designed to be warm, inviting and functional by the homeowners, was already complete when we were invited to help explore the possibility of improving it further with a different rug from the one originally selected. The homeowners felt that a rug with a slightly cooler palette from what was already in the room would gently contrast with and complement the rest of the room's colors and be worth seeing. 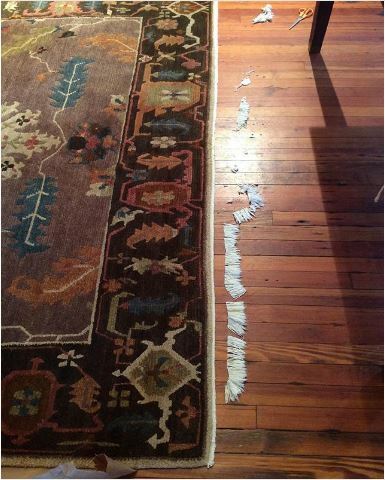 We were asked to show several rugs from our inventory to prove whether or not a different rug would be better. This 8x10 reproduction Turkish Oushak design hand-knotted in India fit naturally into the room like the finishing piece to a puzzle; to the delight of the homeowners who are enjoying the welcome result to their experimentation. If you like colors, here's a hand-knotted oriental rug that has just about all of them. 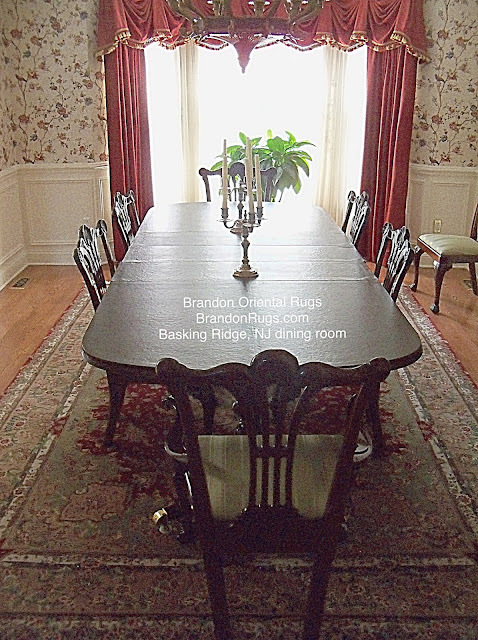 Brandon Oriental Rugs -- Hand-knotted oriental rug. 2'10" x 4'0". Vegetal dye, hand-spun wool; Gabbeh style; made in Afghanistan. Suggestive of well-cultivated fields and fruitful gardens, rugs like this are undeniable affirmations of bountiful life. Oriental rugs are like the organic food of floor coverings: they cost a little more, but they are really good for you. 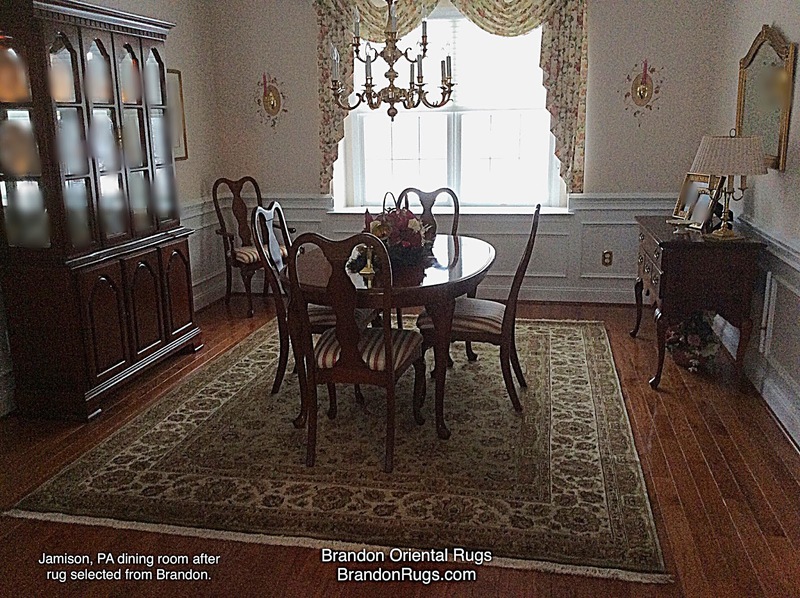 Evidence of the benefits are clearly seen in the "before" and "after" images seen here of a dining room in Jamison, PA now graced by a real hand-knotted oriental rug from Brandon Oriental Rugs. Mark Twain wrote, "...Naked people have little or no influence in society." The same can be said about naked floors. 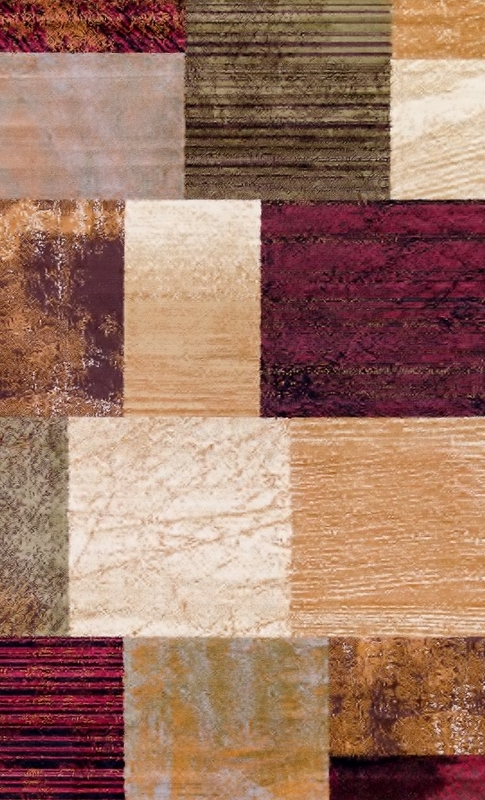 Looking for Something Different in Your Search for Quality Area Rugs? Willing to Be Motivated by Quality, Integrity, and Service Instead of by Discount Prices? When you're shopping for a fine handmade oriental rug that is as unique as you are. When you want a rug that that truly stands out as special. When you want a rug that the crowd can't have or find with a few clicks. 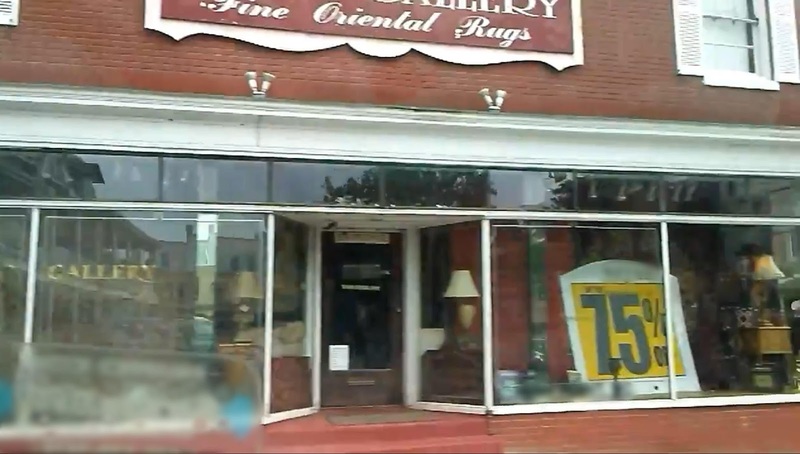 Just looking at storefronts, Brandon Oriental Rugs stands out as promoting something different from other rug stores in the region. Clearly, Brandon is not seeking to lure business with perpetual SALE events and ginormous discounts. Considering it has been in business over twenty-five years, Brandon must be quietly offering something that appeals to customers just as much as any bold announcement of discounts. 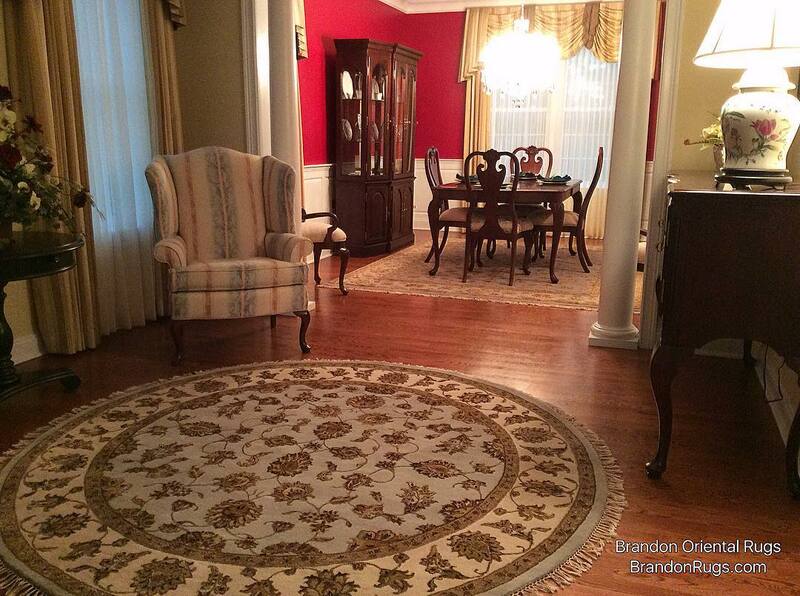 Brandon Oriental Rugs offers the best price based on quality EVERYDAY. "No reason to hurry; no reason to wait." Doylestown, PA store has perpetually ginormous discounts. Off what? Lahaska store has perpetually ginormous discounts that invite negotiation and permit wiggle room. 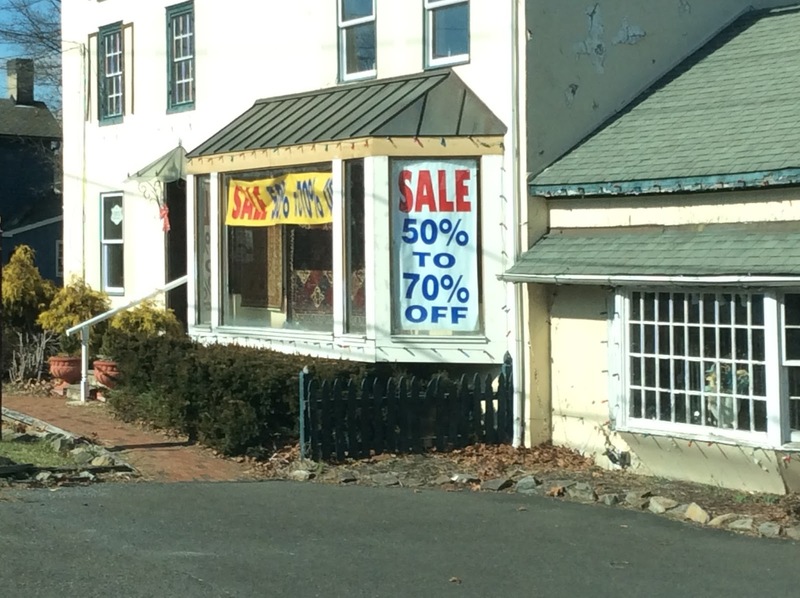 New Hope store has offer that seems to add up to 65% but is actually less than 65% off of whatever. "Why doesn't Brandon have BIG SALE events like other rug stores?" We believe the practice of starting high to sell low is dishonest. 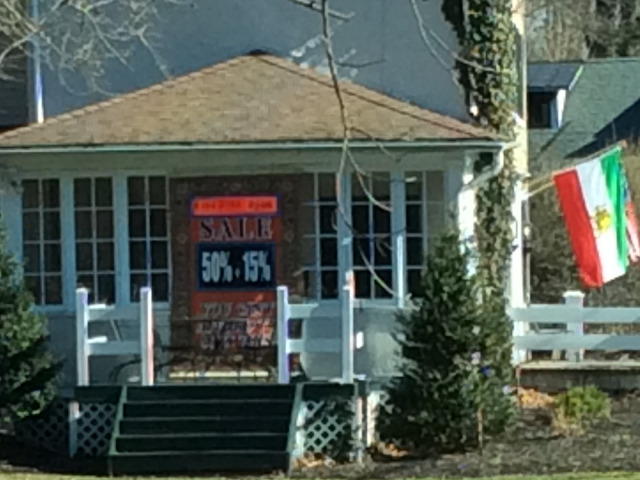 We don’t inflate "tag-price" in order to advertise discount prices or percent-off sales. (Afterall, if the price on the tag is misleading, why should you believe any other statement made to you about a rug?) Likewise, Brandon does not claim to offer “wholesale” or “direct import” prices as a customer lure. In fact, Brandon's prices are as good as, or better than, prices at stores that choose to make such claims. Value in a purchase is about quality, not discounts. Exaggerated claims of large discounts in conjunction with limited time offers actually diminishes value by creating a sense of urgency that interferes with thoughtful decisions. Brandon is pleased to offer customers a relaxed shopping experience free from pressure or that uncomfortable urgency. Truthfully, 70% OFF at one store isn’t necessarily better than 50% OFF at another store. And Brandon's everyday price -- which is based ON quality not OFF some imaginary original price -- is better than those discount schemes. Brandon's policy is that PRICE IS BASED ON QUALITY. Comparisons of price for a rug at one store versus price for a similar rug at another store should be based upon an understanding and appreciation of the underlying quality of the products offered. Quality Pricing allows Brandon's customers to perform meaningful comparisons while shopping. It enables them to purchase their rugs with confidence and enjoyment of real savings. Brandon does not claim to offer the "LOWEST PRICE RUGS" because there are a lot of low quality products we don't and won't sell. 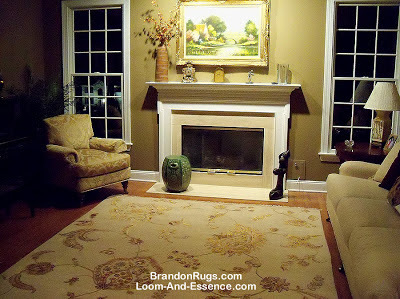 Brandon Oriental Rugs does promise the "best values on fine quality handmade area rugs." Brandon's policy might not provide the excitement we've all been conditioned to feel in response to advertised BIG SALE events. Instead you will enjoy more lasting benefits from real savings based on real prices associated with real quality.